Increasing importance of travel to the island by Cuban nationals living abroad. Diaspora tourism, a mainstay of the tourism sector of Caribbean nations, has been ignored by the Cuban government and discouraged by some sectors of the exile community. Its performance is intrinsically tied to the political whims of both the Cuban and U.S. governments, and is victim to the estrangement among Cubans. In recent years, things have started to change. In the United States, demand for visits to the island by Cuban nationals residing in the United States has been positively affected by: the growing number of recent immigrants from Cuba; changing attitudes among older exiles about travel to the island; and more liberal U.S. policies regarding travel to Cuba. On the supply side, the Cuban government, whether by necessity or by design, has been giving signs of recognizing and promoting diaspora tourism. Defining and obtaining data on “Diaspora tourism” is not a straightforward endeavor. To avoid confusion, it is important to start with some definitions regarding tourism flows. Technically, in the literature on tourism the term “arrivals” is used to refer to individuals entering a country. Nonresident arrivals, referred to as “visitors,” are classified as either tourists or excursionists. A “tourist” is defined as a visitor staying at least twenty-four hours in the country visited, whose purpose in making the journey is related to: (1) leisure (recreation, holiday, health, study, religion, or sport); (2) business; (3) family; (4) mission; or (5) meeting. “Excursionists” or day visitors are visitors staying less than twenty-four hours, such as sea cruise travelers (UNWTO 1995a). It is clear from the above definitions that what determines inclusion in the “visitor,” “tourist” or “excursionist” categories is residency abroad. This pertains to national as well as non–national arrivals. Citizens residing abroad who are travelling to their country of origin and entering with the country of origin’s passport. Native–born individuals residing abroad who are travelling to their country of origin regardless of citizenship or passport used. All individuals of a given national origin travelling to the country of origin. It is the broadest (third) definition that most researchers have in mind when they study “Diaspora tourism” (Newland and Taylor 2010). Research using this definition, however, is limited by data availability. When travelers arrive at a country’s border, the standard practice is to identify the traveler by country of residence and country of citizenship. Country of residency is the way in which data is collected and disseminated by international tourism agencies and organizations, and is used to construct international tourism flows. It is also the primary way by which individual countries report their own tourism data although a number of countries also publish data on tourist arrivals by country of citizenship. The only “Diaspora tourism” series that can be obtained from standard tourism data resources follows the first definition above.2 Constructing a series using the second definition would require either collecting additional data on place of birth of visitors or establishing special requirements for native-born individuals residing abroad and travelling to the country of origin. Data on the third, and broadest, definition could only be constructed by survey methods. Cuba does not identify the number of nonresident nationals arriving at its borders in any of its official publications, but rather lumps them together with arrivals from the Caribbean area. The United Nations World Tourism Organization (UNWTO), after accounting for tourist arrivals to Cuba from the individual countries of the Caribbean, publishes statistics on a category of visitors to Cuba called “Other Caribbean.” For some years now, this series has been considered by analysts as corresponding to nonresident Cuban nationals (Espino 2008; 2010), although it was not at all clear whether all nonresident Cuban nationals were included in this category or the definition of nonresident nationals that was used. Recent work by a researcher in the Island (Perelló Cabrera 2012; 2013) has clarified that this series includes only nonresident nationals born in Cuba, regardless of their place of residence or country of citizenship.3While the category includes visits by Cuban nationals residing in any country — and not only residing in the United States — performance of arrivals in this category has been closely tied to ebbs and flows in U.S.–Cuba relations (see Table 1). In 2001–2003 visits to Cuba by nonresidents increased steadily, counterbalancing the decreases in visitors from other sources due to security concerns following the terrorist attacks of September 2001. In June 30, 2004, however, the Bush Administration imposed added restrictions on travel to Cuba. The new rules reduced the ability for individuals to obtain licenses for all categories of travel to the island, but the largest group affected was individuals travelling on family visits — almost exclusively Cuban nationals residing in the United States. Moreover, whereas the definition of “family” in the regulations had been liberally interpreted, the new regulations defined it narrowly to be immediate family: parents, spouses, children and siblings. Finally, visits by Cuban nationals, which were allowed once a year, were restricted to once every three years. The impact on the number of visitors travelling to Cuba from the U.S. was immediate. In 2004, Cuba officially reported a decline of visitors from the United States of 34.6 thousand visitors, (from 84.5 thousand to 49.9 thousand), while the decline in the “Other Caribbean” category was of 42.8 thousand visitors (from 168.2 thousand to 125.4 thousand). The reduction in total visits by U.S. citizens and residents in 2004 therefore can be calculated at approximately 77.4 thousand visitors. While travel to Cuba from the United States was severely curtailed for the next few years, the period 2005–2008 saw a recovery in travel from both types of travelers from the U.S. By 2007, visits by nonresident nationals reached 192.8 thousand, surpassing pre–2004 levels. The strong performance in this market segment can be attributed to a number of factors, among them: a rise in Cuban immigration to the United States; the increasing number of the Cuban diaspora residing in countries other than the United States; and the willingness of individuals to travel in violation of U.S. laws. In March 2009, the Obama Administration announced that it was turning back the Bush area restrictions and the impact was immediate: visits by nonresident nationals increased by 30.5% in 2009 to nearly 300 thousand; nonresident arrivals posted another strong increase in 2010 of 26.7%, followed by a leveling off in 2011, with arrivals increasing by 6.0%. In 2012, visits by nonresident nationals declined by 3.4%, and are reported to be down by 9.65% in the first half of 2013 (Perelló Cabrera 2013). The decline in 2012 can be attributed entirely to a decline in visits from nonresident nationals from the U.S., which declined by 6.7%, while visits from non–nationals residing in other countries rose by 2.2% (see Table 2). The sharp decrease in visits from Cubans living in the United States is difficult to explain. Cuban nationals residing in the United States traditionally have accounted for the majority of nonresident national visits to the Island (see Table 3, showing that in 2009, 55% of nonresident nationals traveling to Cuba came from the United States). This is hardly surprising given that by far the greatest concentration of the Cuban diaspora resides in the United States (see Table 4) and the close proximity of the United States to Cuba. As mentioned above, the factor that has primarily affected the annual flow of visits to the island of Cubans from the United States, and therefore total nonresident arrivals, has been the travel restrictions and changes in travel policies of the United States and/or Cuban side. 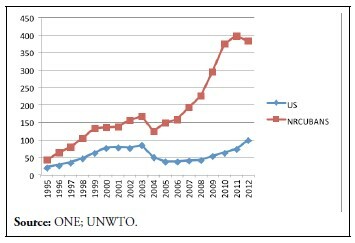 Additionally, the flow of nonresident nationals has closely tracked tourist arrivals from the United States category (see Figure 1). What is interesting about the decline in nonresident national arrivals to the United States in 2012 is that there was no significant change in travel policy by either the United States or Cuba and that such arrivals declined while total arrivals from the United States increased sharply. On the first point, a Cuban policy change that might have affected travel to Cuba by nonresident nationals was embodied in Resolutions 222 and 223 of the Ministry of Finance and Prices and Resolution 122 of the Customs of the Republic, all passed in 2012. Together, these resolutions significantly increased the tariff rates imposed on imports of goods to Cuba carried by travelers carrying more than 100 pounds of goods. The measures were meant to discourage trips by mulas — individuals who are paid to travel to Cuba for the primary purpose of entering goods. While the new tariffs might have discouraged some mulas, it is unlikely that they were responsible for the decline in nonresident national arrivals for a number of reasons. First, the resolutions also increased tariffs on alternative means of sending goods to Cuba. Second, they might have instead promoted more trips by mulas, each seeking to bring in goods under the 100 pounds threshold. And finally, the new import tariffs did not take effect until September 3, 2012, while visits by nonresident nationals reportedly already were decreasing in the first half of 2012 (falling by 4.8%). The series for nonresident arrivals and U.S. arrivals historically have moved together (Figure 1). This to be expected as they both are highly sensitive to some of the same factors, for example economic conditions in the United States and travel policy. In fact, it is provable that a large component of U.S. arrivals is made up of Cuban-American individuals, born in the United States and travelling to Cuba on their own or as minors accompanying their Cuban-born parents. Interestingly, in 2012, the 5.7% decline in travel by Cubans in the United States to the Island was accompanied by a 33.3% increase in arrivals from the United States. This suggests that Cuba might have changed the definition of who to count as a nonresident national. A change in defining nationals as only those travelling with Cuban passport regardless of place of birth would account for the 2012 performance. In fact, if nonresident nationals from the U.S. were added to the figure on arrivals from the U.S., a performance closer to what would have been expected would result. In 2011, 358.6 thousand visitors came from the United States, including Cuban nationals; these figures place total arrivals from the U.S. as the second largest source of visits to Cuba. In 2012, total arrivals from the U.S. increased by 2.3%, not an unreasonable increase given the continued precarious economic conditions in the U.S., no major travel policy changes, and the exhaustion of the pent-up demand created by the travel restrictions of the Bush years. 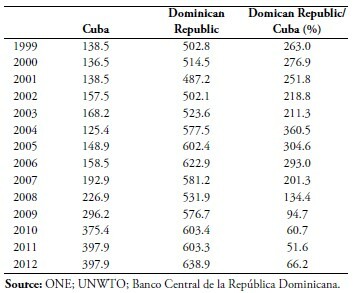 In order to put the performance of visits of nonresident nationals to Cuba in perspective, Table 5 compares arrivals of nonresident nationals to Cuba and to the Dominican Republic. 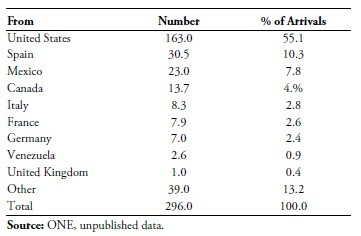 Cuba and the Dominican Republic share many historical, cultural, and socioeconomic characteristics (González-Corzo and Larson 2007) and both have large diasporas concentrated mainly in the United States and Spain (see Tables 4 and 6). The data series are not strictly comparable due to the fact that, unlike Cuba, the Dominican Republic follows the more standard procedure of identifying only as nonresident nationals those traveling with a Dominican passport residing abroad, regardless of place of birth. In a sense, this narrower definition stresses the point we want to make. With a smaller and less economically well-off Diaspora, the Dominican Republic attracts a significantly larger number of its nonresident nationals than Cuba. While prior to 2008 one would argue that this difference could be attributed to U.S.-imposed travel restrictions and a hostile environment in the exile community towards travel to Cuba, that for the most part is not the case at present. In 2012, the Dominican Republic received 66.2% more nonresident nationals than Cuba — a difference of over a quarter of a million tourists. So large a difference can only be attributed to differences in attitude from governments towards their Diasporas. This difference in attitude is reflected, for example, in the high cost of Cuban consular fees, by far the highest in the region (Díaz-Briquets 2010). While the Dominican Republic openly promotes visits by nonresident nationals, Cuba discourages them by artificially high travel costs. The standard airfare from Miami to Havana runs around $450, a comparatively high cost, which can be attributed to the U.S. embargo and travel ban. Airfare, however, is but a small percentage of the total cost incurred by Cuban nationals just getting to Cuba from Miami. The traveler must add the cost of a Cuban passport or entry permit, excess baggage fees and other tariffs to the cost of fare. The typical trip to Cuba runs into the thousands of dollars (Shoer Roth 2013). Depending on the purpose of the visit, different segments within the Diaspora tourism market can be identified (Pérez-López and Díaz-Briquets 2011; Newland and Taylor 2010). While each of these market segments will exhibit different behavioral and expenditure patterns, these patterns are for the most part different from those of other tourists. expenditures on gifts given in appreciation for friends’ and relatives’ hospitality. capital type investments or purchases, such as land, housing, real estate, cars, boats, second homes, etc. Not only does a good portion of Diaspora tourists’ expenditures fall outside of the definition of tourist expenditures, but their pattern of expenditures regarding tourism goods and services differs from that of other tourists. 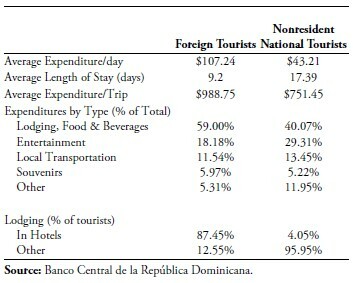 Table 7, with data from the Dominican Republic, illustrates this point as well as the behavioral differences between Diaspora and other tourists. On average, the nonresident national tourist stays longer in the country but spends less per trip on tourist-related activities; the Diaspora tourist also tends not to use the country’s hotel infrastructure. In a country with a large component of Diaspora tourism, their distinct behavioral pattern will affect their average tourist indicators, increasing average length of stay, decreasing average expenditures, and lowering average overnight stays in hotels. While data on expenditures by nonresident national tourists is not available for Cuba, it is likely that nonresident national tourists to the island behave in ways similar to those to the Dominican Republic. In fact, some of Cuba’s tourist indicators seem to confirm this inference (see Table 8). While tourist arrivals have increased by 54.8% since 2001, gross revenues from tourism have increased by a much lower 36.0%, even when the revenue figures are in nominal rather than real terms. Overnight stays in hotels and other lodging establishments also exhibited a lower growth than arrivals, increasing by 50.4% percent. As a result, both average expenditure per tourist and average number of night stays at hotels and other lodging establishments have actually decreased since 2001. While the data for this analysis refers to overall tourism, the increasing importance of nonresident national arrivals no doubt had an impact. It may be what motivated the Cuban government in March 2010 to lift the prohibition that prevented Cuban resident nationals from staying in hotels destined for international tourists; with nonresident tourists now able to invite family and friends in such facilities, hotel stays and tourist expenditures by nonresident tourists are expected to rise. 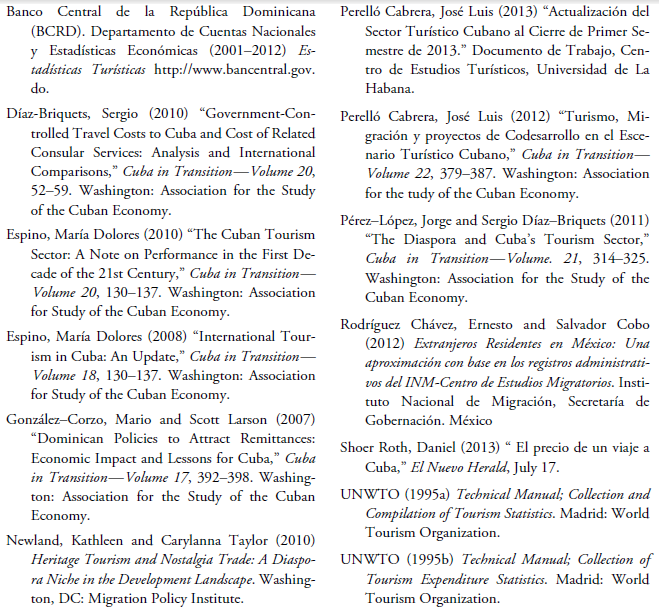 This article has concentrated on analyzing a small but measurable segment of Diaspora tourism to Cuba. Given the current conditions, this segment is almost exclusively made up of individuals on family visits. While other segments of this market are likely to play an important role in the future (Pérez–López and Díaz-Briquets 2011), family visits are already an important component of the Cuban tourist market. As migration from Cuba to the United States increases, the potential demand for visits to the Island will continue to grow. Whether this potential is realized or not will depend to a large extent on Cuba’s policies and attitudes toward the geographically closest members of its Diaspora: Cuban nationals residing in the United States. 1. An earlier version of this paper was presented at the Cuban Research Institute’s Ninth Conference on Cuban and Cuban-American Studies, Florida International University, May 23–25, 2013. 2. Among the countries that publish data on nonresident nationals travelling home, typically using the first definition, is the Dominican Republic. 3. Cuba requires an entry visa for travel to the Island by all individuals born in Cuba Island irrespective of country of citizenship or type of passport used. María Dolores Espino is Professor of Economics in the School of Business at St. Thomas University in Miami, Florida.